Welcome to my Experience Healing Page. 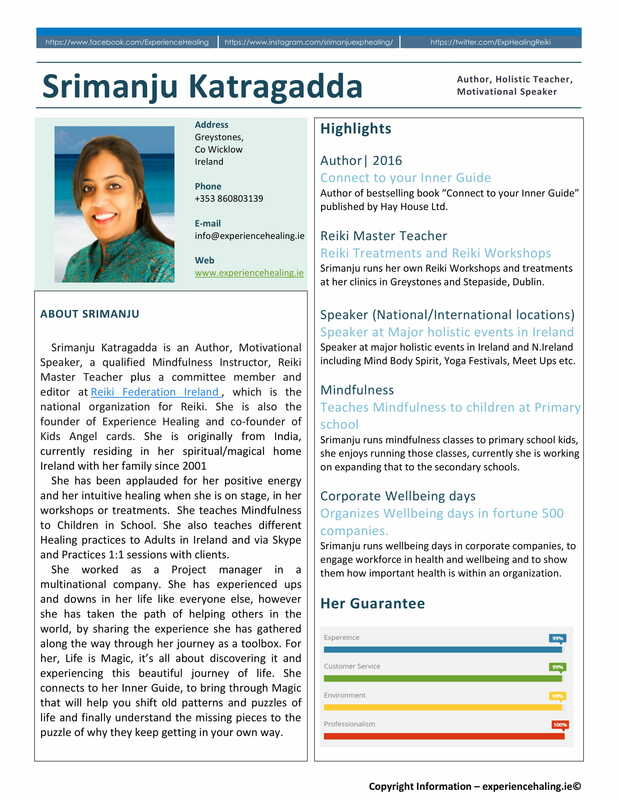 Hello, I am Srimanju Katragadda, founder of Experience Healing and co-founder of Kids Angel cards. 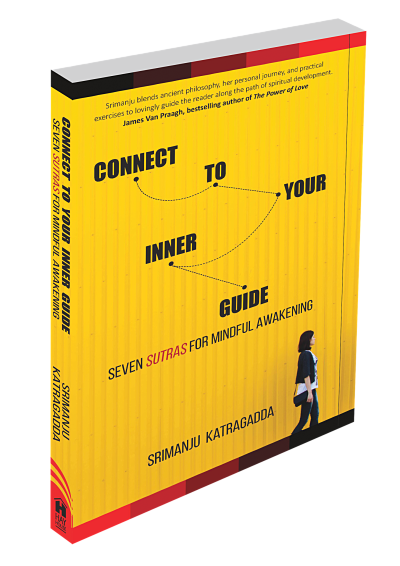 Hay House Author – Connect to your Inner Guide – Seven sutras for mindful awakening, Bestseller book in Asia. (insert the book sales link), Spiritual Healer, Teacher, and Motivational speaker. I am from India and residing in magical Ireland since 2001. I worked as a Project manager for a multinational company and recently started working with clients as my full-time career. 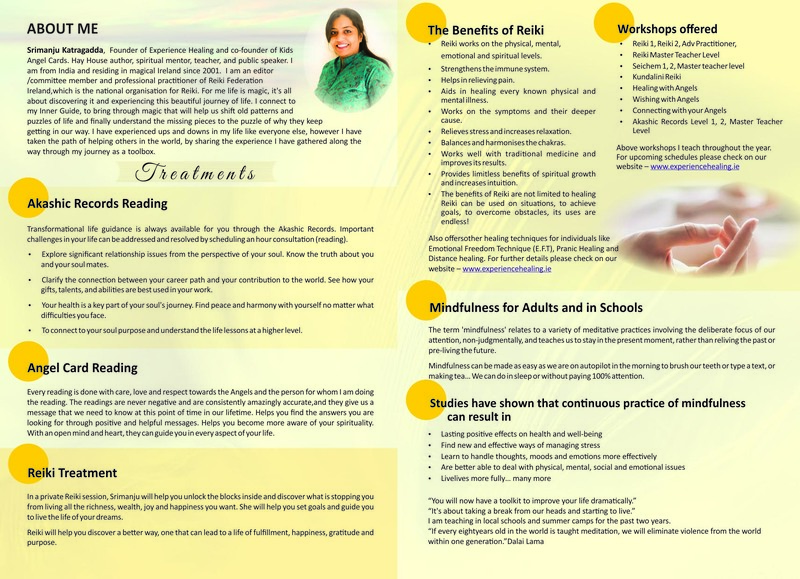 I am an Editor/committee member and Professional Practitioner of Reiki Federation Ireland, which is the national organisation for Reiki. For me Life is Magic, it’s all about discovering it and experiencing this beautiful journey of life. I connect to my Inner Guide, to bring through the magic that will help shift old patterns and puzzles of life. I have experienced up and downs in my life like everyone else, however, I have taken the path of helping others in the world, by sharing the experience I have gathered along the way through my journey as a toolbox. In my toolbox, I have many solutions to the everyday chaos we get into. There are practical and workable. Tried and tested. I came across Reiki when my youngest daughter was 3 months old. She was suffering from reflux pain and sleepless nights. On a visit to my friend’s place he saw her pain and treated her to calm with Reiki when she was only 3 months old. Subsequent Reiki sessions made her overcome the health issues. And also improved my own Join Inflammatory Arthritis a chronic condition that developed after my pregnancy since I started learning Reiki. Seeing these results in my daughter, I quickly became hooked on finding out more about this wonderful treatment and subsequently went on to learn Reiki and now teach and practice with wider groups. I am a proof to my own story that this energy healing works. 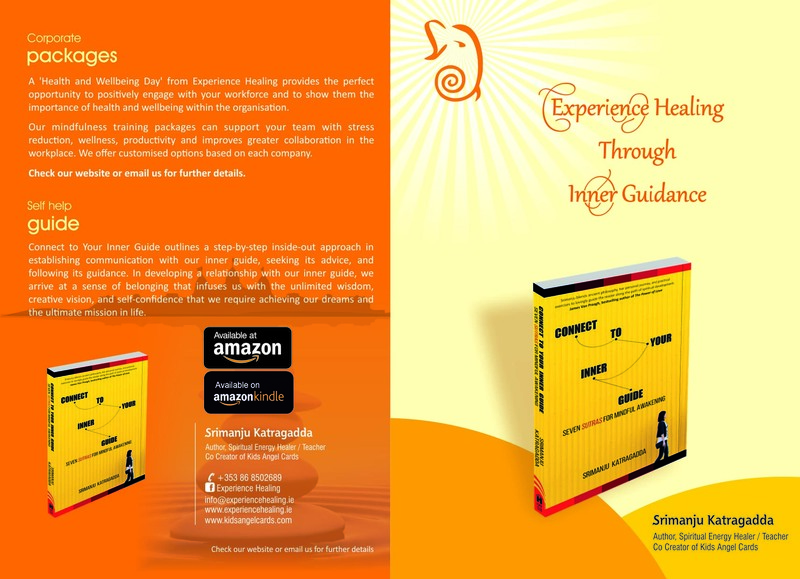 Ø Mindfulness instructor to children in schools and adults in corporate companies. 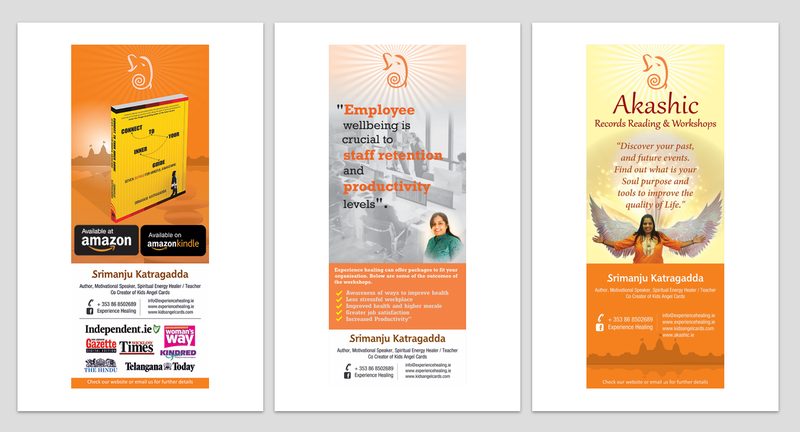 And the journey continues and many more. Everyone is unique, and we work with different levels to heal ourselves. I believe that everyone needs are different to how they can be healed. We are unique and our journeys to heal as well. I use my intuitive healing skills to offer the needs of the clients. I offer the Private consultations in Belarmine Medical Center in Stepaside Dublin, Ireland and over Skype and Telephone. Regular workshops include Akashic records reading, Reiki, Mindfulness, meditation evenings, Healing with Angels. From time to time I run healing Workshops with Art, Cooking and different aspects that inspire me and benefit the needs of the students. Make Intuitive healing crystal jewellery and artworks. Click here to sign up for my newsletter and receive Free Mindfulness Meditation.